David Whitmer was born January 7, 1805, near Harrisburg, Dauphin County, Pennsylvania. While he was young, his parents, Peter Whitmer Sr. and Mary Musselman, moved to western New York. A reporter who met his father in 1885 wrote that Peter raised his family as “a hard-working, God-fearing man, a strict Presbyterian [who] brought his children up with rigid sectarian discipline” (Chicago Tribune, 17 Dec. 1885). The Whitmer family were active Church goers in the German Reformed Church. David’s mother was born in Germany. David’s three older brothers were confirmed members of that church. However, in 1829, the family began to hear of a young man named Joseph Smith, who was gaining attention for his teachings about a new book of religious scripture called the Book of Mormon. David, still living at home with his parents, met a man named Oliver Cowdery. Both men were curious about Joseph Smith and even more curious about the book. They learned that Joseph Smith was translating the book in Pennsylvania, and Oliver Cowdery decided to go there and find out about the book directly from its translator. He promised to keep David informed as to what he learned. Oliver wrote three letters to David during this time. 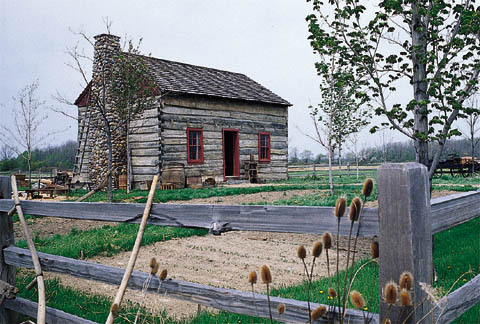 In his first letter, he told David he was not only convinced the book was true, but he had volunteered to act as Joseph Smith’s scribe, helping the work advance much more quickly. A second letter also emphasized Oliver’s belief that the book was authentic and quoted portions of it. The third letter changed the lives of the Whitmer family forever. Oliver asked if he and Joseph could come to David’s home to work on the translation. The work and even the life of Joseph Smith was in danger from people who were afraid to let the new book come to light. David took the request to his family. His parents were concerned because David had a great deal of work to do and taking time to go for Joseph and Oliver would hamper the family’s efforts. They decided David shouldn’t go unless God required it of him. David accepted his parents’ request but then took the problem to God in prayer. He asked that God help him complete his work in record time. He was able to do two days’ work in one day. This convinced his father that God intended David to bring the men to their home. He told David he could go for them as soon as he’d finished the fertilizing. Joseph Smith and Oliver Cowdery moved into the Whitmer home and Emma, Joseph’s wife, joined them not long after. This created a great deal of work for Mary, David’s mother. One day, as she was going to milk the cows, an angel appeared and told her that because her contribution to the work was so great, she was entitled to receive a personal testimony that what they were doing was truly God’s work. She was shown the gold plates on which the book was written in ancient times. Although her sons would later serve as official witnesses to the reality of those plates, Mary actually saw them before any of the men in her family. She found that the work no longer seemed to be a burden to her. David Whitmer was later permitted to view the plates and other sacred objects as well, while an angel held them. He signed his name to a testimony of this vision. He was baptized into The Church of Jesus Christ in 1829. David’s home was the center of historically significant events—the work of translation, many visions and revelations, and the first conference of the Church. The Church of Jesus Christ of Latter-day Saints, which many continue to inadvertently refer to as the “Mormon Church,” was formally organized in the Whitmer home. David was listed as one of the first six members, helping to fill a legal requirement for the organization of churches. David Whitmer took several missionary trips with Joseph Smith, but after a time, he was chastised by revelation for being too focused on worldly things. He was instructed to return to his father’s home for a time. The Whitmer family faced some trials in their work with the Church. While Joseph was back in Pennsylvania translating, Oliver Cowdery decided a revelation which had been received needed to be changed. He did not, of course, have that authority, since revelations come from God to a prophet. However, he persisted and also convinced the Whitmers that he was right. Joseph returned to their home and helped them to understand that the revelations must be written as given by God and not according to the desires of men. However, Hyrum Page, a church member, claimed to be receiving his own revelations through a seer stone. He convinced Cowdery and the Whitmers these were true revelations. They did not yet understand how God worked and that having multiple prophets would only lead to confusion, which is why there could only be one at a time. Page’s so-called revelations contradicted the New Testament and modern revelations. After a revelation came to Joseph Smith explaining how revelation works, Page and the Whitmers, as well as others who had believed them, renounced Page’s claims. In 1831, David Whitmer married Julia Ann Jolly. Later that year he was called to serve a mission to Missouri. He and his missionary companion, Harvey Whitlock, were to preach as they journeyed to Missouri. Near the end of the year, David traveled to Ohio, where he became a high priest in the Church, and then he and his wife moved to Missouri. The Mormons encountered intense persecutions in Missouri. David Whitmer, along with other men, was forced into the ironically named Independence Square with a bayonet at his back, where he had his clothing removed and he was tarred and feathered. He was ordered to denounce the Book of Mormon or face death. Other men clicked their guns to reinforce the order but David boldly testified of the Book of Mormon. The captors let him go. The Whitmer family moved to Clay County. There, two of David’s brothers died as a result of persecution, one leaving a young wife and the other a wife and small children. A third died later of a leg infection. David’s mother was a faithful member all her life. The remaining Whitmers began to have problems with their faith as a result of the many trials they had to bear and the new financial challenges arising in the young church. David was appointed to oversee the Church in Missouri and helped to select the first apostles, but when he began to challenge various aspects of Mormon doctrine, his membership was called into question. He was invited to meet with church leaders to work out the problems, but he refused. He was excommunicated for various reasons, including writing letters calling himself the president of the church, even though he’d been removed from his responsibilities in the church. He had become very vocal in his attacks on the church and its leaders. When the Mormons were forced by mob activity to leave Missouri, the Whitmers stayed behind. David moved to Richmond, where he served as mayor for a year. He retained his testimony of the Book of Mormon, however. In 1878, two Mormon apostles visited him in Missouri. He was asked about his testimony and reiterated the vision in which he was shown the gold plates. Again, in 1882, a young Mormon missionary named Matthias Cowley visited him and also asked to hear his testimony. He gave it, but Cowley wrote that it was given as a duty. He felt that David Whitmer knew what was true but had lost sight of the joy the gospel can bring when it is fully lived. In 1888, the American Cyclopedia and the Encyclopedia Britannica claimed that David and two other witnesses had denied ever having seen the plates. David was nearing death at that time, but publicly refuted those claims. He testified that none of the witnesses, including those who had left the church, had ever denied those sacred experiences. That I have never at any time denied that testimony or any part thereof, which has so long since been published with that Book, as one of the three witnesses. Those who know me best, well know that I have always adhered to that testimony. And that no man may be misled or doubt my present views in regard to the same, I do again affirm the truth of all my statements, as then made and published. After the Mormons left Missouri, the Reorganized Church of Jesus Christ of Latter-day Saints, now known as the Community of Christ, attempted to convince David Whitmer to join with them. However, he felt they were not properly informed of what Joseph had really taught. David disliked centralized authority and felt Joseph had fallen as a prophet just before David left the church. William McClellan and some of his relatives convinced David to join them in forming a new church to continue where they felt Joseph had left off. David became president of this church, but in time, he and the others recognized they were operating without authority from God. The church had only a few members and dissolved after its last surviving member, Jacob Whitmer’s granddaughter, passed away.